Rug hooking group met today and I didn't have any tire problems so off I went to the Loft. I was able to look at all the new patterns and fun things to make which was so relaxing. So I looked around Country Loft and took some Fall pics of the store. she gave me this sweet quilt for my plain faced doll. that Jack made to take the picture. Michele had just finished making a dress for her new old doll. So Michele and Jan were busy discussing where to sew the hem. .
Cheri pattern I had to have. I have never made a penny rug. cute on a fall shirt .It's about two or two and half inches. inspiration all around me and feeling like I got something done. Have you ever stayed at a Haunted Hotel? A vacation that my hubby and I went on that was quite interesting. Jack had loved collecting trains and so when we went on vacation I would plan places that had little antique stores and some old history. We had been to Tombstone one of the most haunted towns of the old west during this vacation trip. This town is famous for the shoot out at the O.K corral. Doc Holliday ,Wyatt Earp the Clanton brothers and all those western characters you have seen in the old movies. Tombstone is the town where these men hung out because frankly it's in the middle of no where. Tombstone also has the old boot hill cemetery which you had to enter through a store.One interesting place we went to was the Birdcage theatre and museum. This old west theatre was exactly like it was in the old western days and preserved very well with lots of western atmosphere. It was dusty and you felt like you had stepped back in the old west. 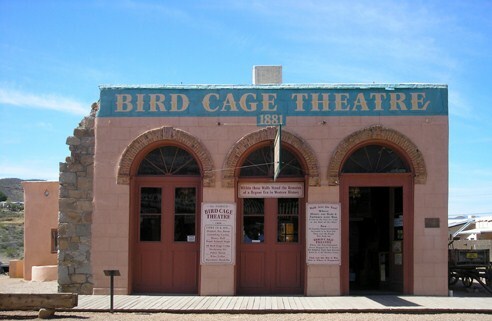 The Bird Cage is known for having numerous ghost sightings. It was very interesting how little their theatres were in those days. It was very small and if you had box seats you were really noticeable! This Theatre which served as a saloon and high stake poker was played which was evident by over 26 deaths 20 gun fights and 140 bullet holes in the ceiling and building. This was the wild west and where legends started! As we would drive I was the navigator and looking thru my vacation brochures I saw Bisbee Arizona an old copper mining town.This small town was hilly filled with little shops old buildings and antique stores The biggest thing in the town of Bisbee was the coppermine with it's tours which we went on and a big old hotel. I love old buildings and so I asked my husband can we stay here and we splurged and walked up the steps and into this old hotel. As Jack signed our name in I noticed a book that said something but the word Ghost stood out. I asked the person who was registering us what was the book about. 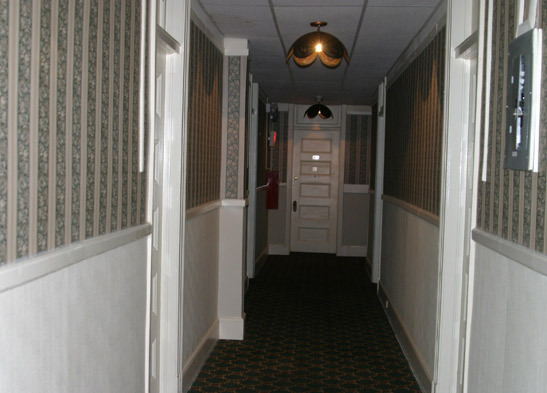 Apparently these were ghost experiences people had wrote about that had happened when they stayed at this Hotel. Now if you noticed anything about me the power of suggestion works wonders. 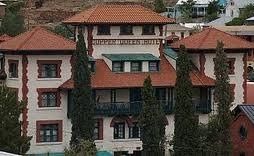 The minute the lady said Haunted hotel I was on Ghost alert .This Hotel is called the Copper queen Hotel and known for this fact.No where did triple AAA say this in their brochures .I realize from my experience at this Hotel that you don’t have to necessarily see a ghost to have a ghost experience. We walked up this old wooden grand staircase to the second floor where ghosts had been seen. The ghosts are also seen in the bar downstairs . Now I have never been in a old western brothel but this is what I imagined a room would look like tall ceilings lace curtains old wall paper a big fan above your head. . All the architecture of the room made you totally feel like you were back a hundred years in this old copper mining town. I went in the old room looked about and felt uneasy. Jack went down to get something out of our car .I sat on the bed and realized the bathroom was a large room with a long tall window and but kind of scary for some reason. You could hear a bar or a nightclub next door and muffled loud voices. All of a sudden I heard a small tapping at the door . It would softly tap tap tap. I went to the door no body was there. This was the floor where the ghost hung out and I was a little uneasy. I went and looked out the window and the town below when I heard the soft tapping again. I went out the door and looked down the hallway expecting to see something when Hubby popped out laughing from around the corner. Well now that he had his laugh I did not sleep the entire night. The power of suggestion in an old Haunted Hotel is incredibly powerful you can imagine my imagination was off the charts. 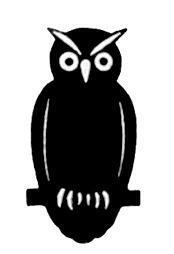 So all night I looked like a little owl when ever I would hear anything my eyes would pop out . It doesn’t help hubby could sleep thru a mine blast! 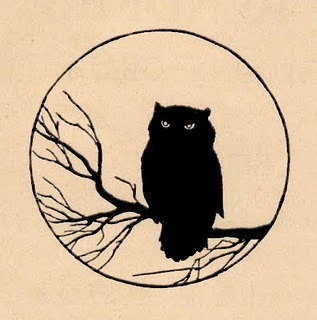 Being scared in the middle of the night is an awful feeling .You just wait for the dark night to end. So yes I have stayed in a Haunted Hotel the worst night with no sleep and Thank God I didn’t see a Ghost but plenty have. If your interested here is their site and more history and legends about the Hotel. cat in a fall wreath. out and I am going to start stitching. Crest is up on a hill on one side is busy El Cajon the other side is Harbison Canyon and the community of Alpine. When we have wildfires it comes up the sides of the hills and these communities are effected like us. Well today I noticed a haze and smelled smoke. I looked to the sky and saw a small fire plane circling so I knew there must be a fire on Harbison Canyon or Alpine side of Crest. So I ran to the computer looked at the news and saw there is a fire about four and a half miles away in Harbison canyon. That sounds like a long distance but fires go up the sides of the rocky hills and they don’t follow a curvy road. 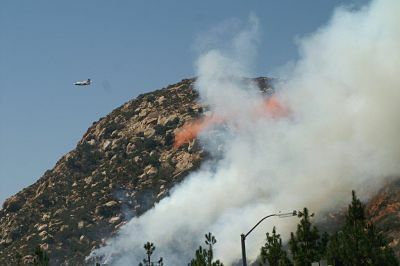 Here’s what was going on the other side of Crest at the bottom of our hills. They evacuated two schools in Alpine. You can tell we take brush fires seriously. I could see the plane but I couldn't see the fire. during a fire in Crest.White smoke is good to see. These pictures were sent in by Alpine Citizens. This is what was needed to stop the fire……15 engines. 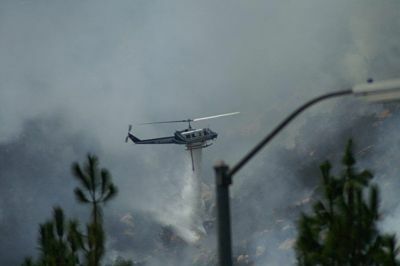 6 hand crews, 2 air tankers, 1 air attack, 2 helicopters, 4 chief office.alpine firedept, lakeside, cal fire, sd county fire authority, sycuan, heartland fire and rescue, san miguel all have equipment on the fire. house talk about a wonderful day. This year she is going to have Ernie who sculpts out of wood decoy ducks and all sorts of animals. This is the link to her web site. I can hardly wait to see what she has to sell this year. Stephanie is also in my rug hooking group.You'll love all her goodies! Since we don’t have snow where I live the quiet of everybody snug in their homes is what I enjoy. Friday I met Linda for lunch we had a quick lunch and then I remembered there was a craft show at a ladies house we have been going to for the last couple of years. So off we went. I got so many ideas for birdhouses and she had a wonderful way of using making old water pails for circulating fountains. Poor Jack he is going to be busy. Judy makes wonderful signs and folk art paintings. Maybe this is too primitive for you but I liked this little painting she did. I am happy to say it’s been cooling down a little in temperature. Tuesday I was suppose to go to my rug hooking group and my Suv had a real low tire. Well I am glad I decide to stay put and not drive down the hill. I had a bolt in my tire! That is the third flat tire I have had this year. I am taking her apron off and doing a better tea dyeing job. I bought her like that! Yesterday was an exciting day I got skype and I set up a webcam to see my daughter and baby. Have you seen that U tube of grandparents that installed a web cam? It has gone viral and I totally understand how they feel. It was such a funny video! I set up skype and then I was having problems I had put the Cd in the computer nothing happened . So I called my daughter and she walked me through some steps when Oh dear! there I was on the computer with no make on, my hair a mess and a ugly housework shirt on . I thought it was funny how I could see myself on the computer and realized Oh my gosh when did I get old? Lol.It was great seeing the baby and Megan I could even see her dogs and her craft area. I love technology!! !I just don’t like installing it.I was as goofy as those seniors when they installed their web cam. This was as exciting a moment as when I finally got the hang of spinning on my spinning wheel.Or as exciting as when I got my first egg from my chickens. It was remarkable to be able to see the two of them just sitting there looking at me. After I could see myself and the baby and Megan I decided to run and get some of my dolls. I figured a bright doll the baby would like so I began of course a puppet show and I had his attention.The baby was even smiling at the screen. Of course Maulie had to jump on my lap to see what was going on.Poor dog she couldn't understand that Megan wasn't here. Maulie would run to the window and look out when she heard Megan's voice.Megan kept laughing at me but when she was a child she loved puppet shows with Bert and Ernie.I would stand at her crib and make funny voices and she loved them. Even though she could see me she was in that childlike world of fantasy of watching these characters. 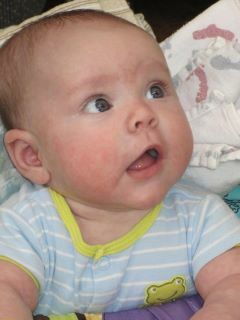 So I have decided to start a puppet show when Megan calls so Baby Jack can have his very own puppet show from his Nana. Lol . The San Diego Quilt Show and our local quilters. Today I got a call from my daughter telling me her hubby thought I could install the skype that her hubby had given my husband for his birthday. It will feel like the Jetson's remember that cartoon show where they depicted the future and people would talk on a monitor where you could see someone. I can’t even imagine seeing someone while I am speaking at the computer. I’ll need to put my lipstick on when I am talking at the computer I don‘t want to scare Baby Jack. O.K back to quilting and the show. Isn't this a pretty quilt! Maulie would love this quilt. And so ends the quilt show in San Diego California. A visitor walking in front of the convention center.